..a Britain in which we pass our own laws and govern ourselves. In which we look beyond our continent and to the opportunities in the wider world. In which we win trade agreements with old friends and new partners. In which Britain is always the most passionate, most consistent, most convincing advocate for free trade. In which we play our full part in promoting peace and prosperity around the world. ..We will invoke Article Fifty no later than the end of March next year. ..it is not up to the House of Commons to invoke Article Fifty, and it is not up to the House of Lords. It is up to the Government to trigger Article Fifty and the Government alone. ..Because we voted in the referendum as one United Kingdom, we will negotiate as one United Kingdom, and we will leave the European Union as one United Kingdom. There is no opt-out from Brexit. ..we will soon put before Parliament a Great Repeal Bill, which will remove from the statute book – once and for all – the European Communities Act. ..And its effect will be clear. Our laws will be made not in Brussels but in Westminster. The judges interpreting those laws will sit not in Luxembourg but in courts in this country. The authority of EU law in Britain will end. ..And that means we are going to leave the EU. We are going to be a fully-independent, sovereign country, a country that is no longer part of a political union with supranational institutions that can override national parliaments and courts. And that means we are going, once more, to have the freedom to make our own decisions on a whole host of different matters, from how we label our food to the way in which we choose to control immigration. ..We have voted to leave the European Union and become a fully-independent, sovereign country. We will do what independent, sovereign countries do. We will decide for ourselves how we control immigration. And we will be free to pass our own laws. ..We are not leaving the European Union only to give up control of immigration again. And we are not leaving only to return to the jurisdiction of the European Court of Justice. ..It should make us think of Global Britain, a country with the self-confidence and the freedom to look beyond the continent of Europe and to the economic and diplomatic opportunities of the wider world. Because we know that the referendum was not a vote to turn in ourselves, to cut ourselves off from the world. It was a vote for Britain to stand tall, to believe in ourselves, to forge an ambitious and optimistic new role in the world. It was the sort of speech you could hear Margaret Thatcher cheering from the drawing room of her heavenly mansion, as she interrupted her tea with St Peter who had been summoned for a lecture on the difference between petros and petra. If Brexit actually proceeds as Theresa May has set out (which, given the parliamentary arithmetic in the House of Lords, along with a veto-threatening SNP, as well as a plethora of known unknowns in the 27 remaining members of the EU, not to mention a belligerent European Parliament, any one of which could scupper the whole deal), she will be the first prime minister to govern a “fully-independent, sovereign country” since Ted Heath gave effect to the European Communities Act in 1973. She will be able to make free-trade deals with Canada, China, India, Mexico, Australia and New Zealand. There will be freedom to forge (if not lead) a new Anglosphere of peace, prosperity and democratic cooperation – “a truly Global Britain” – shining its light of liberty in the world. She will be able to open our borders to the skills and talents of the Commonwealth and the world, and close them to the indigence of Europe as she wishes. By withdrawing from the Common Agricultural Policy, the cost of food should plummet. By leaving the Common Fisheries Policy, our fish stocks will once again swim through British territorial waters, reserved for British fishermen. She can reform VAT – indeed, remove it altogether from goods and services if she so wishes. She’ll even be free to label food as she wants (or not). All of this results from being a globally-orientated, economically-prosperous, democratic, sovereign, self-governing nation. Theresa May seemed to delight in the impending restoration of that freedom and sovereignty. There was no sorrow or regret at the way the stupid people had voted: “..trust the people we will.. the people gave their answer with emphatic clarity.. So now it is up to the Government not to question, quibble or backslide on what we have been instructed to do, but to get on with the job.” It is almost as if she were a true BeLeaver, a swashbuckling Brexiteer, all along. 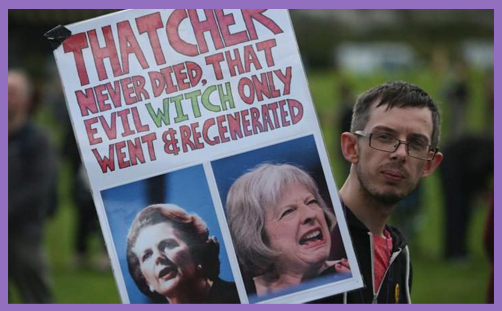 Either way, she is now an object of hate – the regeneration of that “evil witch” Thatcher, no less. What is this visceral hate of moral discipline? Why do they despise the organic organisation of society? Why do they loathe the conservative human person, as though we are devoid of reason and feeling? Why do they despise the traditions of our forebears and the freedoms they won so that we may find our meaning and purpose in the world? What is so detestable about the conservative moral vision which, by God’s grace, radiates goodness and peace, and fashions roles of human empowerment? Or is it only so hated, despised, loathed and detested when mediated by the reason, will and freedom of a conservative Christian woman?